Finca Cortesin Hotel, Golf & Spa’s decision to become the first course in Spain to relay its greens with a new variety of Bermuda grass has received a glowing endorsement after the exclusive resort moved into the top 10 of Golf World magazine’s updated rankings list of the ‘Top 100 Resorts in Continental Europe’. The deluxe venue in Andalucia, Spain, was one of the biggest risers in the new benchmark industry poll of the continent’s best places to play and stay, climbing up nine places to eighth in the latest standings. Assessed over five different categories – golf courses, accommodation, practice facilities, accessibility and amenities – Finca Cortesin scored an impressive total of 88.7 points of out of 100, with the magazine’s judging panel singling out the resort’s recent investment in its golf facilities as the major factor for its new, improved position. As well as completing a comprehensive upgrade of all its greens last year, relaying them with a new, environmentally-friendly, type of Ultra Dwarf Bermuda grass, the resort also undertook the total renovation and reconstruction of all its bunkers using the renowned ‘Better Billy Bunker’ system. Announcing its decision, the judging panel remarked: “Few other resorts in the list have implemented as many changes and improvements in the two years since our first resorts ranking was published. “During that time, the resort has built 32 luxury villas …. while the club has also upgraded its greens with a new environmentally-friendly Bermuda grass and reconstructed every single one of its bunkers. These amendments have ensured the resort has stayed true to its designer Cabell Robinson’s vision of creating a golf course where “no hole has less than championship quality”. The new accolade helps to cap a remarkable period of success for Finca Cortesin which has seen it add to its burgeoning reputation as one of the world’s top luxury golf resorts. As well as the resort’s acclaimed Hotel Cortesin being crowned ‘Hotel of the Year – Overall’ by Preferred Hotels & Resorts – the world’s largest independent hotel brand – Finca Cortesin was also named ‘Best Resort in Spain’ by the country’s Condé Nast Traveler magazine, while its 18-hole championship golf course moved into the top 20 of the Top 100 Golf Courses European rankings list for the first time in its history. 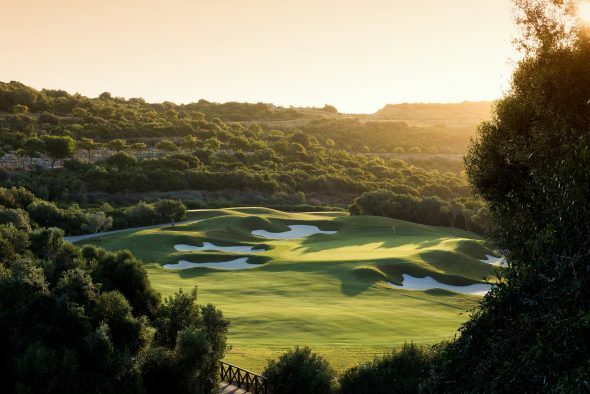 Miguel Girbes, director of golf at Finca Cortesin Hotel, Golf & Spa, said: “Our number one aim at Finca Cortesin has always been to deliver the best possible customer experience so we’re thrilled to have achieved such a big move in a list featuring all the biggest names in European golf. Opened in March 2006 and set across a vast 532-acre estate, Finca Cortesin – a member of the prestigious European Tour Properties Network – is regarded as one of Europe’s most exclusive modern golf and lifestyle destination resorts.